It's decorative gourd season, motherfuckers. Why not revisit some now-problematic classic teen horror comedies? Did high school students really have whipped-cream wrestling and closet makeouts? Why did teenagers in the 80s all look like they were in their 20s? Which boutique sold Styles his T-shirts, and did Chris Knight from Real Genius shop there as well? Explanations are probably long overdue. Apparently there's nothing in the rulebook that says that a humanoid canid can't play basketball! This movie is like the first Karate Kid, a 50s movie set in the 80s. Very strange affect. Teen wolf! coming out to play...! Why did teenagers in the 80s all look like they were in their 20s? Which boutique sold Styles his T-shirts, and did Chris Knight from Real Genius shop there as well? I remember seeing this on vhs shortly after release and found it jaw droppingly weird in a not good way, so just letting future historians know it wasn’t part of the zeitgeist. Early on, I was slightly perplexed by the idea that werewolves would be really good at basketball, but then as the movie progressed, extremely perplexed that they would make a teen werewolf movie and decide it should mostly be about basketball. It was the summer after I'd graduated from college (this was 2002, just so we're clear). I had a childhood friend who had similarly just graduated from college. We were bumming around our home town waiting for the next thing (me: no plan. him: grad school) and my mom was out of town with whatever man she was dating at the time. Teen Wolf was playing as a midnight movie at a nearby historic theater. We decided to go. So we drank some Zima in the parking lot in the minivan and then stumbled to the 7-Eleven for cigarettes (neither of us were really smokers -- I think we were just leaning into this thing). 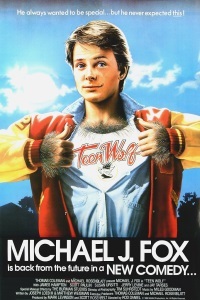 Then kind of drunk on Zima (as much as you can be drunk on Zima), we went to go see Teen Wolf. And while I still look upon this friend with much affection, I do have to say "getting drunk on Zima in a minivan and then seeing Teen Wolf when I was really old enough to know better" was probably the lowest point of my life up until that point (I've had many lower points since). This was probably the most appropriate way to watch Teen Wolf, however. You know, if you're going to. Please don't miss the indispensable companion piece, by Summer of Tears. I believe I found this here, years ago. Rest assured, Darksong, that your story is way better than the movie itself. In fact the movie’s only redeeming virtue may be that it led to that story.